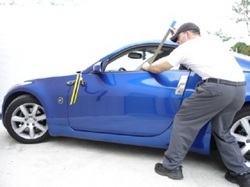 Paintless dent removal or PDR, is a procedure in which dents and dings on cars can be repaired by applying pressure on the opposite side of the dent to make it return to its original height or position. Special tools are needed for this procedure and not all car mechanics can do this. There are special technicians for this procedure. Having paintless dent removal done by someone inexperienced with the procedure ups the risk of worsening the dent or ding of a car—which may sometimes lead to having to get a paint job for your car when it was not necessary in the first place. Before the paintless dent removal procedure is performed, the technician assesses the condition of the paint on the dent; if the paint has been chipped or corroded, the technician will not proceed as this will make the paint chip some more or worsen. As a result, the car will need more repair than was necessary. If the paint is still in very good condition, the technician will perform the paintless dent removal procedure by checking the underside of the dent or dents where the he has most access to fix the indentation. The trained technician on the procedure then chooses the tools he will need. One of the tools of the technician is the dent light or a reflection board which aids him in making sure that a dent that has been repaired is totally flat. Without the aid of a dent light or a reflection board, there is a risk that the dent may not be visible in one angle, but visible in another. By applying the right amount of pressure on particular points from the opposite side of the dent, the metal will assume its original position, without any damage to the paint, allowing for a flawless finish.